Since leaving her post as secretary of state, Hillary Clinton earned millions of dollars delivering 41 paid speeches in the U.S. to a variety of companies and organizations. At least 10 of those groups have been lobbying Congress and federal agencies on trade, an issue that has divided Democrats as the Obama administration pushes for a 12-nation pacific trade deal - and around which Hillary Clinton has remained mum. Clinton has spoken in general terms on trade, saying in New Hampshire last month that any trade deal "has to produce jobs and raise wages and increase prosperity and protect our security." But the issue pits liberal Democrats against the White House and Republicans, and there's a chorus of Democrats are calling for Clinton to weigh in. In the weeks since she launched her presidential bid, Clinton has been dogged by questions about whether special interests sought to buy influence while she was secretary of state through donations to the Clinton Foundation and through Bill Clinton's paid speeches. For the first time, Hillary Clinton's financial disclosures provide a picture of the speaking engagements for which she was paid since leaving the State Department and at a time when she was actively considering whether to run for president. According to the disclosures released by the campaign on Friday evening, the former secretary of state earned at least $2.7 million from speeches at companies backing the trade promotion authority (TPA) that President Obama has been seeking in order to "fast track" approval of trade deals. While that's a fraction of the $25 million Bill and Hillary Clinton earned from paid speeches from January 2014 to present, they nonetheless open the presidential candidate to criticism. "She's put herself in the position where people are going to question whether she was influenced by the money she was paid if she supports the trade agreements," said Larry Noble, senior counsel at the Campaign Legal Center. "One of the problems with these situations is even if she reaches her decision for reasons she truly believes in, people are going to question it. It undermines her credibility." A number of Clinton's appearances before the organizations lobbying on trade were among her most lucrative speeches. Clinton earned $335,000 from Qualcomm for a speech in San Diego on October 14, 2014; $335,000 from the Biotechnology Industry Organization on June 25, 2014; and $325,000 from Cisco Systems for a speech in Las Vegas on August 28, 2014. According to data compiled by the Center for Responsive Politics, both tech companies lobbied in support of TPA in 2014 and 2015. They're also members of the Trade Benefits America Coalition, which in November 2014 sent a letter to congressional leaders saying, "As members of the Trade Benefits America Coalition, we write to urge passage of bipartisan Trade Promotion Authority (TPA) legislation this year....Congressional action on TPA is needed to help ensure high-standard outcomes in the Trans-Pacific Partnership (TPP) negotiations, which the United States and 11 other Asia-Pacific countries are striving to complete." That letter was also signed by General Electric and Xerox, companies that paid Hillary Clinton to give speeches in 2014. Clinton earned $225,000 from GE on January 6, 2014 and $225,000 from Xerox Corporation on March 18, 2014. In total, she earned at least $1.4 million from companies signing that letter. To be sure, these companies have lobbied on a variety of issues. Qualcomm, for example, lobbied on more than 15 policy areas including transportation and taxes in 2015. Obama: My Democratic critics on free trade are "wrong"
Likewise, trade has traditionally been a thorny issue for Democratic presidential candidates who are courting progressives and union support. In 2008, Clinton and then-Sen. Obama sparred over NAFTA, the trade deal with the U.S., Canada and Mexico, struck Bill Clinton signed during his presidency. As secretary of state, Clinton publicly promoted the Trans Pacific Partnership (TPP). In her book, "Hard Choices," she said it would level the playing field for American workers in a global marketplace, and that it would "link markets throughout Asia." Now, the Clinton campaign says she'll be watching negotiations closely. Asked whether they're concerned that Clinton's paid speeches from companies that lobbied for TPA could pose a conflict, campaign spokesman Brian Fallon said Clinton has "laid out the bar that needs to be met, to protect American workers, raise wages, and create more good jobs at home." "So, consistent with what she's been saying on the issue, while this is still being negotiated, she will be watching closely to see what is being done to crack down on currency manipulation, improve labor rights, protect the environment and health, promote transparency, and open new opportunities for our small businesses to export overseas," he said. Some Democrats are looking for a more definitive stance. On Sunday Democratic presidential candidate and Vermont Senator Bernie Sanders was asked on CNN's "State of the Union" whether Clinton should take a position on trade and he said: "You can't be on the fence on this one. You're either for it or against." Asked the same question on ABC's This Week, Senator Dianne Feinstein said, "I think it would be very helpful. I think it's been typified by our party in a way which is most unfortunate and that is on the jobs issue." Corning Incorporated and eBay were among companies signing another letter from that same coalition in January 2015, urging passage of TPA. Clinton earned $225,000 in honoraria for a speech at Corning on July 29, 2014; and she earned $315,000 at a speech for eBay in San Jose, California on March 11, 2015 - her second to last before she stopped delivering paid speeches ahead of her presidential announcement. 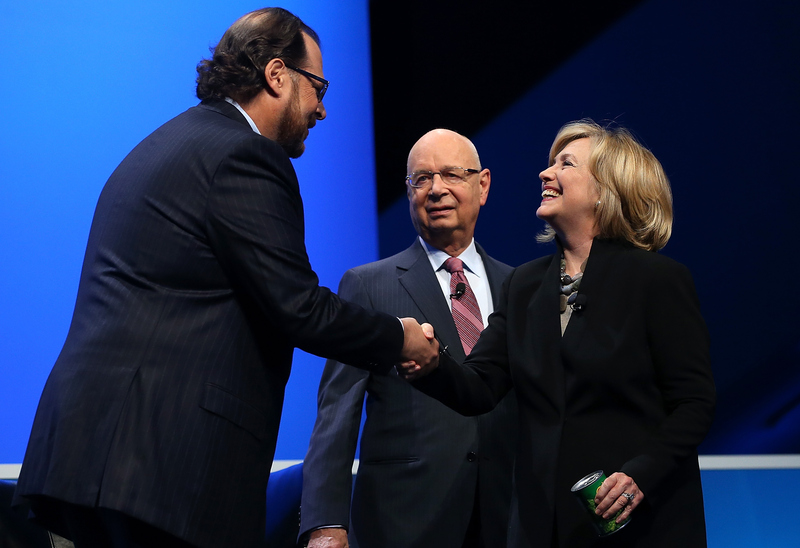 Clinton had two paid appearances for Salesforce.com - one in Las Vegas on February 6, 2014 for $225,500 and another in San Francisco on October 14, 2014, where Clinton also earned $225,500. According to the Center for Responsive Politics, the company in 2014 and 2015 has lobbied on a number of trade related areas, including information technology trade issues, TPA and trade agreements. In a March letter to congressional committee leaders, Salesforce was among the software companies urging Congress to move quickly to pass updated TPA legislation with strong digital trade provisions. What do independent voters think about foreign donations to the Clinton Foundation? On October 8, 2014, Clinton earned $265,000 for an appearance in Chicago with the Advanced Medical Technology Association, or AdvaMed. According to the Center for Responsive Politics, the group has lobbied on issues related to global trade and the international competitiveness related to the medical device industry including TPA, The Trans Pacific Partnership (TPP) and the Transatlantic Trade and Investment Partnership (TTIP). When the House and Senate introduced TPA legislation in April to fast-track the trade deal, the group's CEO said in a statement, "The U.S. Trade Representative is currently working to advance priority issues for the medical technology industry as part of the Trans-Pacific Partnership (TPP) and the Transatlantic Trade and Investment Partnership (TTIP), both of which will greatly improve market access to medical technology in these regions." One other group - the Institute of Scrap Recycling, where Clinton earned $225,000 for an April 10, 2014 speech - has also lobbied on trade issues, but its lobbying doesn't appear to be related to TPP, TTIP or TPA. "It's not unusual for former elected officials to go out and give speeches and make a lot of money," said Noble. "What the problem now is that they're coming back into government after going out and having been paid large sums by these various special interests."